This simple-to-use, exceptionally complete reference work has been updated, expanded and redesigned to meet the needs of today's most demanding wordsmiths. 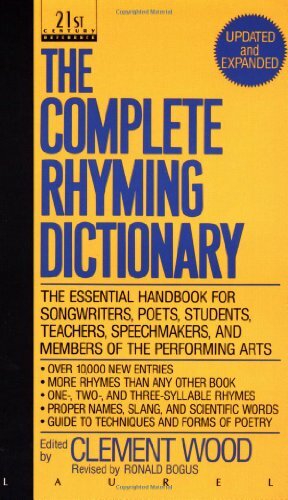 Included here are over 10,000 new entries--over 60,000 in all, sight, vowel, consonant, and one-, two-, and three-syllable rhymes. Clement Wood was a writer, lawyer, and schoolteacher who was born in Alabama in 1883. Wood's work as editor for The Complete Rhyming Dictionary is his best remembered contribution to modern poets everywhere. Clement Wood died in 1950.